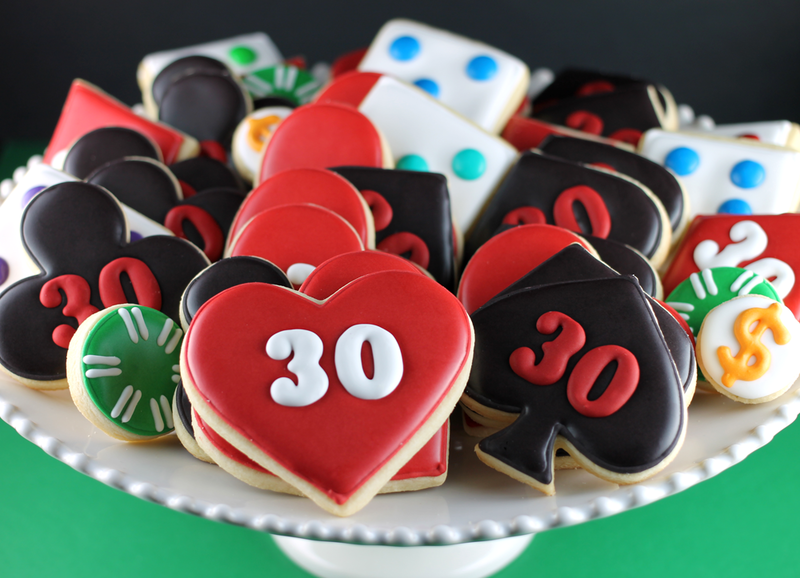 If you’ve been ’round these parts, then you might remember that I made some poker themed cookies once before. The last time I made hearts, diamonds, spades and clubs for the mister. They were decent for a first try, but looking back now, they suuuucked compared to these new school versions. Plus, this bunch includes dice and poker chip cookies for more variety. I think the biggest improvement came from the larger numbers I made this time around. They look so much better on the finished cookie. 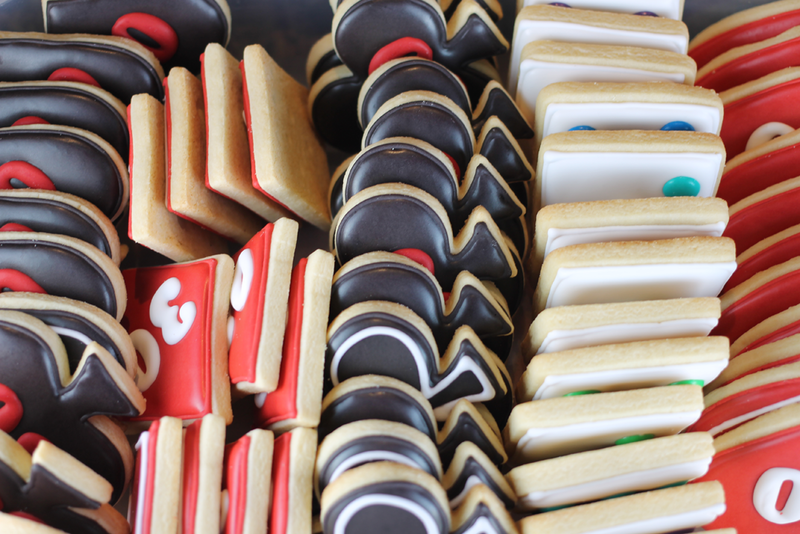 I wussed out last time and made white and black cookies with red outlines. This time I kept it legit and made RED and BLACK cookies. I tend to shy away from using these colors, especially when they’re the main colors, but they turned out awesome. 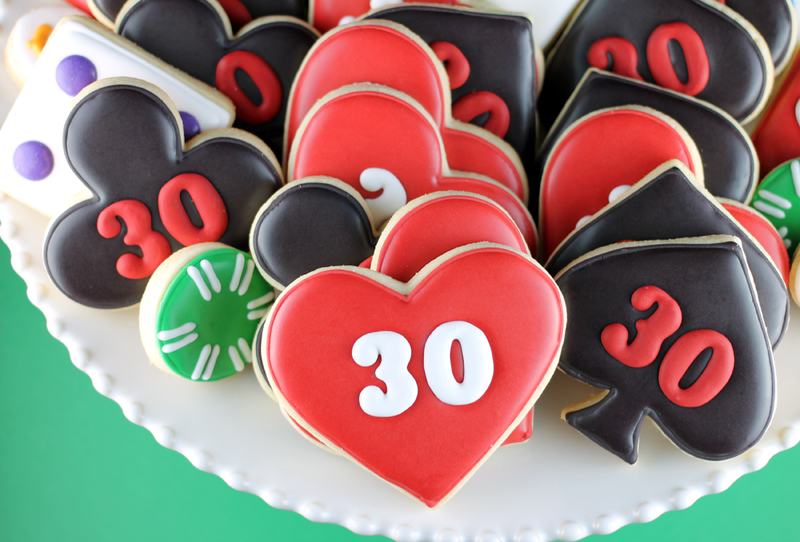 True red and black is really the only way to go with card suit cookies. So bold! I love it. I also made some dice sugar cookies and these have a couple of benefits. Benefit #1: they use white royal icing, so no food coloring is needed. Benefit #2: the colored dots are M&M’s. All I had to do was outline the squares, fill them in with the white royal icing and then drop some M&M’s on top. I just thought of Benefit #3: you end up with cookies topped with M&M’s. Score! I love how these turned out and even though I’m slightly embarrassed by the cookies I made back in March, I’m glad to see that I’ve actually improved. Just imagine where I can be a year from now… two years from now… three or more. In case you were wondering what several dozen cookies looks like, here you go. Thanks to the casino themed birthday party I went to, I also got to spend the night trying my hand at some poker, blackjack and roulette. I went home down $500! It’s a good thing it was fake cash I was gambling with. 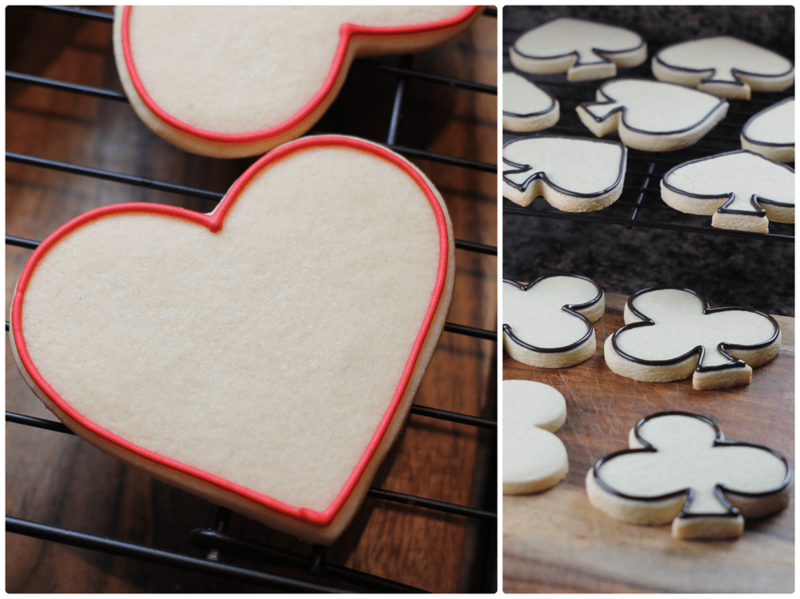 what do you use for your royal icing and colouring? I made the icing with Colourflow powder, and used Wilton gel red and black to colour the icing, which I had to thin a lot. It went on beautifully but now that it’s dry, it’s not smooth, it looks a bit like shiny sandpaper. 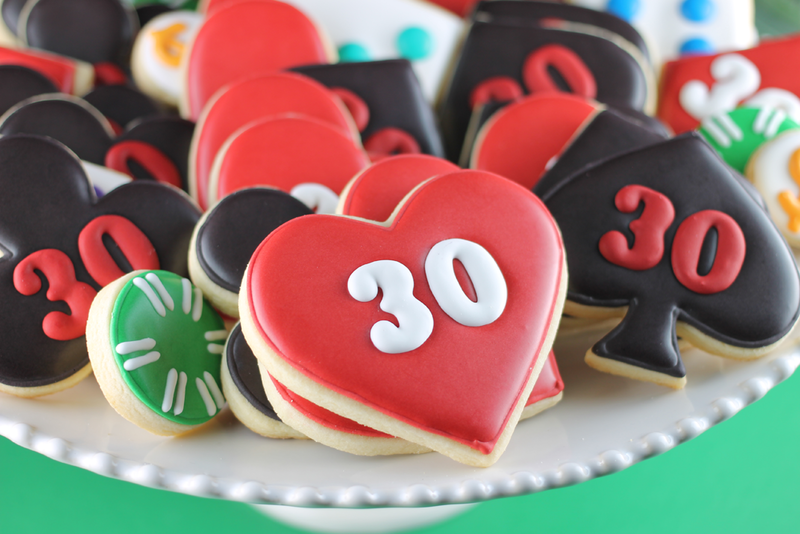 I have been making painted cookie for almost 30 years and lately I just don’t seem to be able to find the right mixture to give me a smooth semi-gloss finish like yours. I do add a few drops of lemon juice – could that be the problem? Thanks! For royal icing, I use a mixture of 4 Tablespoons meringue powder, 1/2 cup water, 2 pounds of powdered sugar, and sometimes a half teaspoon of light corn syrup (I think that’s helps keep the sheen when it dries). I mix everything together with an electric mixer until it comes to the right consistency I need for outlining. Then, once all my outlining is done, I thin the colors with a bit of water to get to flooding consistency. The Americolor brand makes really a really great black and red food coloring. Those are always tough, but they have colors called Super Black and Super Red which allow me to get the super deep color I’m often looking for. 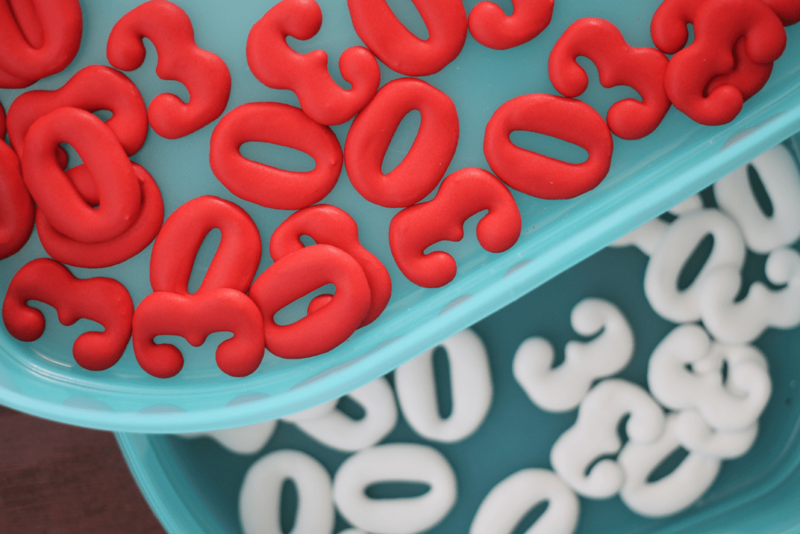 How did you make your numbers? They look incredible. Thanks, Alisa! I first printed out the numbers in a font and size I liked. I then put wax paper over my printout and traced the numbers on wax paper. Let them dry overnight and carefully remove them so they can be dropped right onto the iced cookie while the icing is still wet. 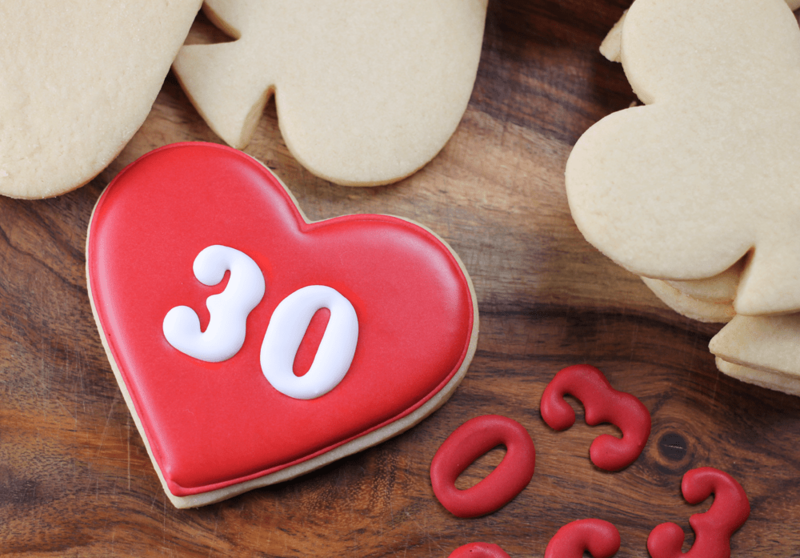 Where did you get 30 numbers?